Mouse goes out to get a snack...and finds a feast! 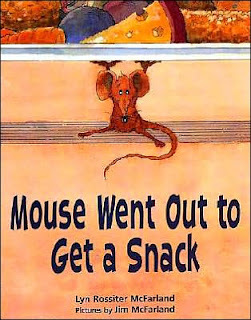 His eyes are a bit bigger than his stomach as he counts his way up to 10 slices of chocolate cake...but when the cat appears, it's all lost and he ends up with just a bit of cheese - the perfect snack for a mouse. This was a big hit at storytime. The mouse is humorous and occasionally needs to be "found" peeking behind walls. There's plenty of counting of various goodies, and the final desperate rush for the hole is a hilariously delightful ending. Verdict: An excellent interactive title for storytime. Recommended. Giving and getting in a surreal landscape. Little Donkey is going to Jackie's birthday party! He picks out a wonderful red kite for a present....a really wonderful red kite....a perfect red kite....maybe Jackie would like something else? But Little Donkey's mother is firm and in the end both he and Jackie enjoy playing with the wonderful kite....and it will be Little Donkey's birthday soon! I enjoyed the realism in the story - Little Donkey continues to long for the red kite even after he has given it and played with it together with Jackie. Happily, his mother doesn't immediately produce a kite for Little Donkey. I'm a little puzzled by the pictures - They seem vaguely surreal, set in a desert-like landscape. I can't figure out if Little Donkey and his mother are wearing some sort of native dress or snazzy pajamas - either way they look comfortable! Verdict: Interesting, but not outstanding. 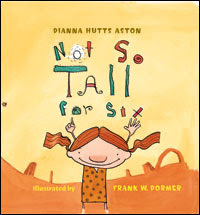 This is the second type of picture book I hate. (First type was those mushy I-Love-My-First-Day-At-School books). This is the "Just ignore the bully and eventually you'll be able to help him/her and then you'll be friends." I detest these! I abhor them! Plot: Kylie Bell is small - like all her family. And that's always been ok. But in first grade, "it's nigh impossible to see the sky with that new bully-boy Rusty Jacks slithering around like a half-starved rattlesnake." (There's a little western thang going on here). But Kylie Bell uses her brains to outsmart him - and her legs to outrun him when he gets mad. Then comes "literary circles" (guess that's the newest term for circle time). Nobody wants that mean bully in their circle. But Kylie Bell remembers her family motto "brave and smart and big at heart" and invites him in. In the end "that big ol softie Rusty Jacks" turns out to be nice. The illustrations are a kind of wacky southwestern, with big faces and Rusty Jacks growing and shrinking to intimidate Kylie Bell. The tones are all brown, orange and gold. Kylie Bell is shown as a rather dainty, petite little girl, even when dashing wildly for safety. Rusty Jacks looks like an old-time villain, with his ten-gallon hat and mean face. Ok, back to my subjective analysis. Sometimes, I admit, it's true. Lots of kids will poke and tease because they want to be included. Sometimes ignoring or being friendly to a bully works. Most of the time it does NOT. The whole point of being a bully's victim is usually feeling helpless. In other words, you don't get the opportunity to help them and win their friendship and/or undying gratitude. And what's the teacher doing while this giant kid is terrorizing a little girl, calling her names and threatening her? And if the other kids like Kylie Bell so much, why don't they stand up for her? I am sick of "bullies are just lonely and misunderstood and as soon as you do something nice for them they'll become your friends" books. Verdict: Yech. Read it if you want to experience the nausea for yourself, otherwise give it a miss. One of my all-time favorite picture books is Duck Soup. It's got humor, cool illustrations, a great read-aloud, and ducks. Ducks are good. Somehow, I missed out on the fact that it's a sequel! Look, look, another one came first! It's a peaceful winter night in Irene's house...until the animals hear a knock at the door. 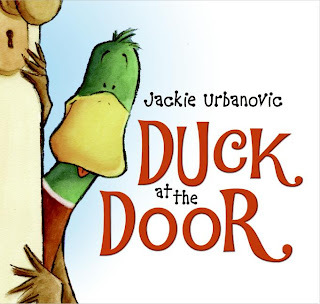 Irene and her friends take in Max the duck, teach him how to live in their house, and become good friends....but then Max starts being a bit exhausting to live with. Fortunately, it's spring, and Max is on his way....but the animals quickly discover they can't live without him and wait eagerly for winter...when Max has a big surprise for them! The pictures are warm and the colors shift to show mood. In the first spread, as Max toils his way through the snow and the animals sleep in the dying warmth of the fire, the colors are gray and white outside and soft, dark browns inside. As Max becomes part of the household, he becomes more rambunctious, interacting with the many other animals. One of the new Toon books particularly caught my eye, since I just got a new copy of Else Homelund Minarik's classic No Fighting, No Biting! These are both focused on sibling rivalry. In the Toon story, Mo and Jo are suddenly gifted with their favorite fighting hero's super powers - but until they work together, they can't accomplish anything. In Minarik's classic I Can Read story, two old-fashioned children squabble until their older sister tells them a series of stories about two quarrelsome little crocodiles. 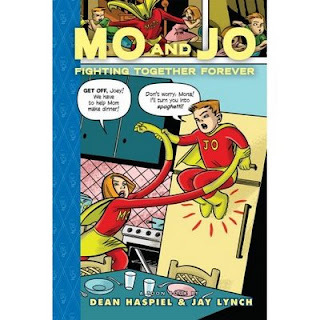 The artwork in Mo and Jo is more appealing, with its sharp cartoons and easy to follow panels. 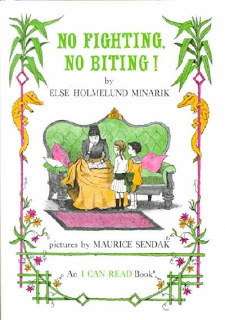 Maurice Sendak's illustrations for No Fighting are sparse but lively, although the old-fashioned dress and setting of the children may turn off some readers. However, Minarik's story is highly superior to Haspiel and Lynch's Toon book. Mo and Jo fight pointlessly and continuously until the evil lizard's taunt makes them realize they must work together to defeat him. This sudden change of heart is unbelievable and the general storyline - the mailman suddenly turns out to be a superhero, gives his powerful costume to two infantile children, and their big "save the world moment" is saving a hippo balloon in a parade. In Minarik's stories-within-the-story, the baby crocodiles work together grudgingly when they must, but it's a learning experience all around - they don't always get along, but they don't always fight either. The two children don't immediately learn their lesson and become models of deportment - they're still squeezing (but not fighting or biting!) when the stories end. Verdict: Although more children may be attracted to the modern art of Mo and Jo, Minarik's stories will prove more satisfying in the end. I recommend both. Keith Robertson represents the best in what I like to call "small town adventures". Many people know his Henry Reed series (or they should!) but I've recently discovered a second series. The Carson Street Detectives, Neil Lambert and Swede Larsen, are the epitome of the small town adventure spirit. They have initiative, stamina, curiosity, and think nothing of a few twenty-mile bike rides in pursuit of their goal! 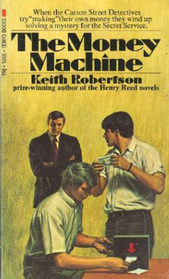 In The Money Machine, a harmless joke played on a friend lets them in on a counterfeiting ring - and some eccentric and dangerous characters. If you love laid-back adventure, humor, and some guys with initiative, meet the Carson Street Detectives! Verdict: The cover shown here is truly horrible. The hardback cover is actually not bad - you might even get some 3rd and 4th graders to read it if they're strong readers. If you have a copy in your library, don't weed it just yet. Used copies are easily available for your personal collection as well. So, we had our end-of-summer-reading party last Tuesday. It was very well-attended, only one child broke down in tears, the face-painting was marvelous, and we ate all the cookies. Next day, I had to call all those whose names were drawn for prizes but weren't present. One slip said simply "Sophie" and a phone number. I called the phone number...."Hello! This is the library, Sophie has won a prize!" "Um, Sophie? She won a prize in our summer reading contest?" "This is a taxidermy shop. There's no Sophie here." I never did find out who Sophie was. The Hungry Tiger would love to eat fat babies...but his conscience won't let him. However, criminals aren't the same thing as babies right? When the Hungry Tiger succumbs to temptation and rashly travels to the kingdom of Rash, he soon realizes he's made a serious mistake. But when Betsy and some new friends, including the fascinating Vegetable Man, show up, the Hungry Tiger has a chance to redeem himself. 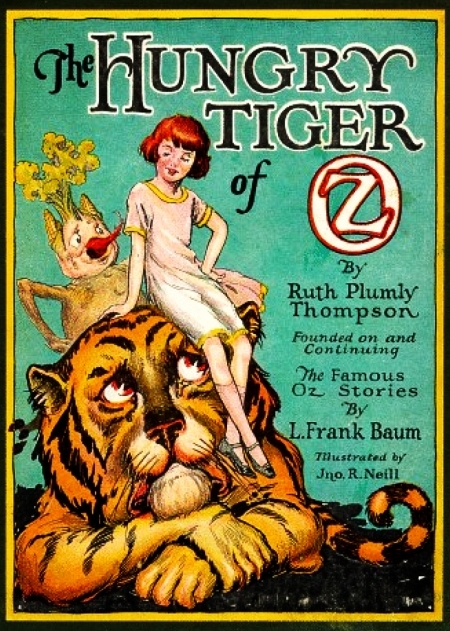 The Hungry Tiger is, apart from the Wizard of Oz, one of the few morally ambiguous Oz characters. 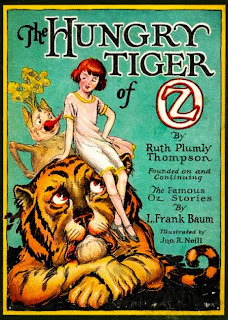 Unlike the other perpetually happy and content residents in Ozma's palace, the Hungry Tiger is constantly tempted to do wrong - or at least realize that he and the other animals are acting contrary to their nature. In addition to this meaty plot, Thompson adds in a host of memorably odd characters, from the Vegetable Man who demonstrates the dangers of excessive vegetarianism to the Airman, whose pomposity and power are so easily punctured. Reddy, the distressed prince of Rash, is a minor character who supplies the impetus for the plot but is really just along for the ride. And it's an amazing ride! Grab a hurry cane and rush to Rash, the adventures are just beginning! This story is a stunningly perfect example of bad parenting, wish-fulfillment, cliches, and unanswered questions. 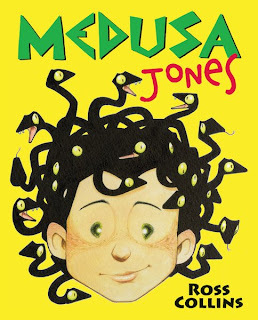 Medusa Jones, a descendent of the Gorgon ("Gran is insane and lives in a cave") and her friends, Mino the minotaur and Chiron the centuar, are constantly bullied and mocked by the Champions, Perseus, Theseus, and Cassandra. Medusa's mother's advice is "You have to work out other ways [besides turning them to stone which Medusa isn't sure she can do anyways] of dealing with people who get on your nerves." Her father's response to Medusa's complaint, "They're so mean to me," is "You have to rise above it." Way to go parents! Of course if your child (and her friends) are being bullied and tormented you should give them useless platitudes! What a wonderful idea! Then Medusa and her friends get stuck going on a camping trip to Mt. Olympus with the Champions. The Champions get stuck, the "freaks" save the day, and become the new champions. Oh, and Medusa turns the Champions to stone at the end. Hmmm. Wish fulfillment, no? Would a bull calf (which is essentially what the minotaur is) actually be able to knock over a tree to form a bridge? Why didn't it hit the Champions? Could a centaur foal actually carry three people across a tree trunk? Even if it's turned to stone half-way? Plus, there's the whole problem that the myths are completely out of context. Presumably Medusa's gran is the official Gorgon - how is Perseus going to grow up to kill her if he's been turned to stone by Medusa? Ditto Theseus and the minotaur? And Cassandra wasn't a hero, or even very popular. So why's she a "Champion"? The mix of mythic and contemporary is jarring. Soooo, Medusa's gran has turned all these postmen to stone. And Medusa's mom has to go to the post office. To do what? Apologize? Pay for the postmen? It's never specified. Medusa's head snakes are apparently sentient. Annnd, it's no big deal when the hairdresser cuts one off? And how come her dad has head snakes? Weren't all the gorgons women? Anyhow, apart from the mythic-contemporary disconnect, the be nice and put up with horrible bullies because one day you will be able to save them and if they're not sufficiently grateful you can always turn them into stone afterwards message is just....mythical. Verdict: I'd like to find a beginning chapter book with myth themes for kids who aren't able to read Rick Riordan yet, but this title has so many issues, it's not worth it. I'll keep waiting for something better - or at least tolerable - to come along. Yee-haw! Rapunzel's here and she's ready to ride! She thinks. After all, she's ridden a wild boar, so a horse should be no problem, right? 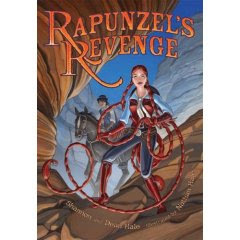 This retelling of Rapunzel's story combines the magical and fairy tale elements of the original story with a wild west adventure. Dwarf miners, giant rattlesnakes, Jack and his goose that (maybe) lays golden eggs, and a happy ending. The art is wonderful, full of life and expression, and supports the perfect blending of wild west and fairy tale. I'll be recommending this to fans of adventure stories, fairy tales, westerns, fantasy, graphic novels, family stories, romance, and basically anybody who happens to walk by! Verdict: This is going to be one of the graphic novel classics of the middle grade group. Purchase it now if you missed out on it before!